Teachers acquire expertise and confidence in engaging their students in scientific investigations, through cost-free regional workshops and online trainings. GLOBE has developed the GLOBE Teacher's Guide that is used to train teachers in the protocols and learning activities that comprise the scaffolded K-12 GLOBE curriculum. The Teachers Guide remains a valuable reference manual to guide teachers when developing learning activities for their students. From kindergarten through secondary school and beyond, GLOBE students learn to be keen observers of their environment. GLOBE students gather valid scientific measurements in their local communities and enter their data into the international database where it is used by students and scientists worldwide. The GLOBE visualization tools offer the ability to display data in maps, graphs and tables. Students collaborate with scientists and other GLOBE students and communities worldwide in using the GLOBE database for education and research. Measurements taken by GLOBE students serve several purposes. Participating scientists use GLOBE data in their research programs to improve our understanding of the global environment. Students learn how to carry out a scientifically rigorous program of Earth observations. Students also learn how to use their own measurements––together with data from other GLOBE schools––as a key part of their study of environmental science. GLOBE provides extensive educational materials to enrich the learning experience of participating students. These materials include a wide variety of classroom and field activities to help students place their measurements in a broader context and relate their own local observations to global environmental issues. Using state-of-the-art technology, GLOBE creates a forum for students to communicate with their peers around the world. This fosters alliances among students and increases their environmental and cultural understanding as well as their sense of global community. 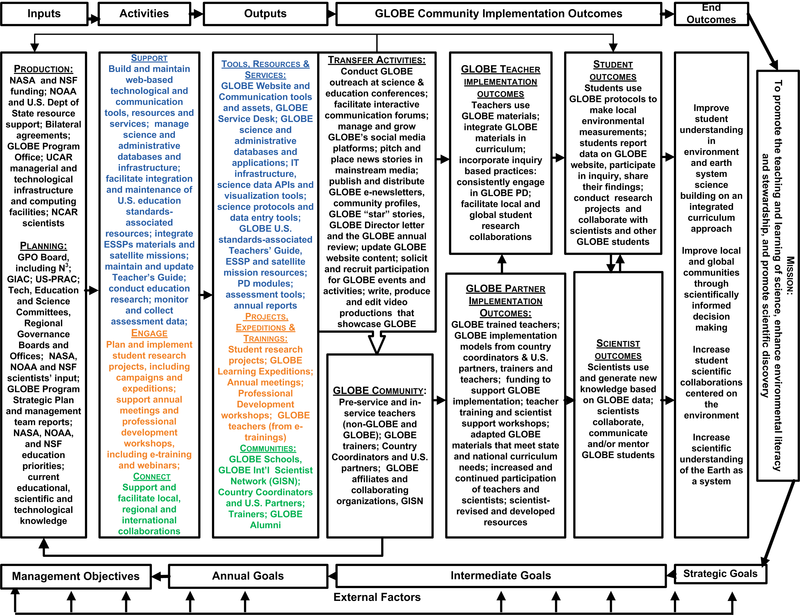 The GLOBE Program Logic Model provides of a visual display how the GLOBE Program works. Developed in 2010 with sponsors and input from the GIAC, it was presented at a workshop at the 2011 GLOBE Annual Meeting. The logic model describes how resources (Inputs) that are provided to the GLOBE Program Office are used to support various of activities that lead to products and services (Outputs) for the GLOBE community. The GLOBE Community uses these products and services for GLOBE implementation.